on the images made from any cameras (list of compatible applications below). This pack contains a set of 70+ unique color grading presets. It's the opportunity for you to give a very original touch to your image! These LUTs were designed to preserve the maximum skin tones. Can be used on photos and videos. These LUTs were inspired by infrared photography, with neutral colors and skin tones preserved. The colors are extravagant and flamboyant, perfect to create a surrealistic atmosphere. Check the beautiful work of Philip Bloom with infrared and his video in Las Vegas. You are shooting weddings, music videos, short films, vloggings? Imagine your slow motion footages and B-roll with these colors! and recommended by Film Riot and Sam & Niko YouTube channels. Sony RX10, Samsung NX500, Canon 5D Mark III, Sony a6300 and a6500, etc. Scroll down to see a before/after example of each LUT of the pack. Final Cut Pro X 10.4 supports the LUTs without plugin. The LUTs are not Lightroom presets. the ICC files included in the pack. files included in the pack. In the STANDARD subfolder you will find the LUTs for standard image profile (Rec.709 and sRGB). In the LOG subfolder you will find the LUTs for flat image profiles. You have to use the STANDARD version of the LUTs. necessary to install the LUTs into Premiere Pro CC 2015 Lumetri panel (+ video tutorials). 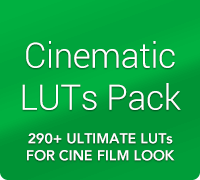 This pack contains LUTs as .CUBE, .3DL and .VLT files (size 33x33x33), and a quick PDF guide. 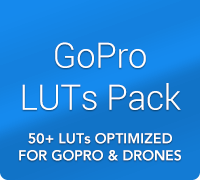 In total there are more than 250 LUTs in the pack (standard, LOG, V-Log and utility LUTs). Regularly I update this pack with new looks (free updates, you will receive an email with download link). You will receive a download link in your mailbox just after the payment. 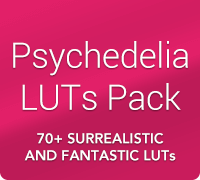 Discover all LUTs included in the pack. Download a ZIP archive containing a preview image (JPG) for each LUT of the pack. 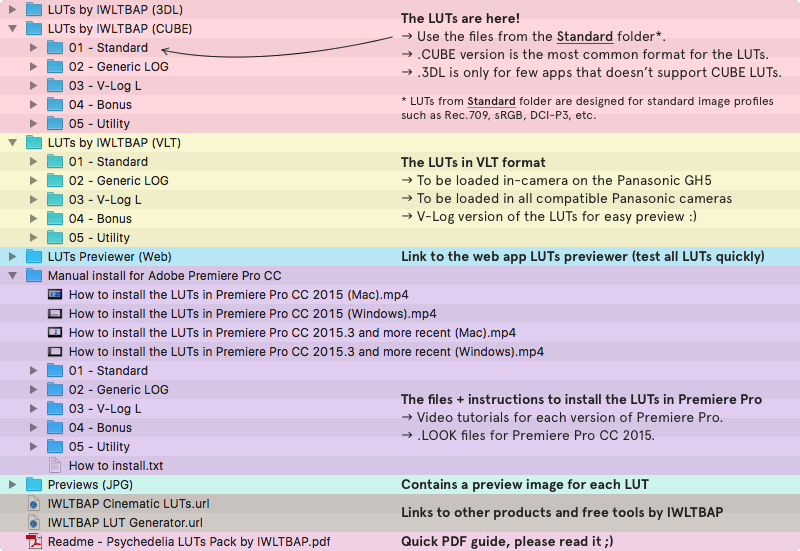 Please find below an example image for each of the 70+ LUTs in the pack. Move the handle from left to right to see before/after. Download these images in bigger size (ZIP, 60MB). The images below are strongly compressed. Don't forget to check the FAQ, maybe the answer to your question is there. Shane Drummond, Sweet Ice Cream Photography, Tom Pumford and Yuriy Rzhemovskiy.